U.S. Route 93 (US 93) is a major north–south United States highway in the western United States. The southern terminus is at US 60 in Wickenburg, Arizona. The northern terminus is at the Canada–US border north of Eureka in Lincoln County, Montana, where the roadway continues into Roosville, British Columbia, as Highway 93. Major cities that US 93 travels through include: Las Vegas, Nevada; Twin Falls, Idaho; Missoula, Montana; and Kalispell, Montana. US 93 begins at US 60 in Wickenburg, a small town about 50 miles (80 km) northwest of Phoenix. 30 miles (48 km) northwest of Wickenburg, it passes through a large forest of Joshua trees, and is thus labeled the Joshua Forest Parkway of Arizona until it reaches Wikieup. From there it heads north, eventually merging with I-40 to head west to Kingman. US 93 then splits from I-40 in Kingman and heads north to the Hoover Dam. Chloride is located off this highway, and Santa's Land remains are on the west side about 15 miles (24 km) before the Chloride Road intersection. This highway was known to be one of the deadliest highways in America until recently. The years of improvement have made it a much safer road to travel, according to the Federal Highway Administration. US 93 enters Nevada on the Hoover Dam Bypass, then winds its way west-southwest through Boulder City before it merges with U.S. Route 95 and then curves northwest towards Las Vegas. These combined routes then join and run concurrent with the Interstate 11 and Interstate 515 freeway through Henderson and southeastern Las Vegas, before US 93 exits at the Las Vegas Spaghetti Bowl interchange just northwest of downtown, heading northbound concurrently with Interstate 15. Those two routes then run in a northeasterly direction through the city of North Las Vegas until they exit the metro area, where US 93 eventually diverges from I-15 to head north towards Great Basin National Park. Near there, the highway joins with the combined U.S. Route 6 and U.S. Route 50 to run northwest towards Ely. At that city, US 6 first departs to the west, then shortly thereafter US 93 leaves US 50 to continue north. Upon reaching Lages Station, Alternate US 93 splits off in a northeasterly direction toward West Wendover. The main route of US 93 continues north from there, intersecting Interstate 80 at Wells before crossing the Idaho state line near Jackpot. Between State Route 318 and Majors Junction (US 6/50), US 93 is designated a Nevada Scenic Byway. From Ely to Schellbourne Ranch, US 93 is part of the Lincoln Highway, the first road across the United States. Shortly after entering Idaho at Jackpot, Nevada, US 93 passes US 30 as it enters Twin Falls. North of here, the highway crosses the Snake River Canyon via the Perrine Bridge en route to an interchange with Interstate 84. US 93 passes through Shoshone and runs concurrently with both US 26 and US 20 before reaching Arco. The highway then turns northwest to enter the Big Lost River valley through Mackay. Just south of Challis, US 93 becomes the northern leg of the Salmon River Scenic Byway as it heads towards the town of Salmon. From there, the highway follows portions of the Lewis and Clark Trail and passes through the Salmon-Challis National Forest before entering Montana. US 93 enters Montana from Idaho at Lost Trail Pass and travels north descending through the Bitterroot National Forest. The highway continues along the Lewis and Clark Trail into the Bitterroot Valley toward Missoula, passing through Darby and Hamilton. At Lolo, US 12 joins from the west and they run concurrenly northeast for 7.537 miles (12.130 km), where US 93 heads due north on Reserve Street in Missoula. US 93 then joins I-90 and runs concurrently westward for 5.352 miles (8.613 km) to Wye, where it heads north. The "Animals' Bridge" on the Flathead Indian Reservation is used by grizzly and black bears. From Wye, US 93 continues north through the Flathead Indian Reservation, where its signage includes the historic Salish and Kutenai names for towns, rivers, and streams. Portions of this section run along the National Bison Range. North of the reservation, US 93 traverses the western shore of Flathead Lake, the largest freshwater lake west of the Mississippi River. North of the lake the highway runs through the cities of Kalispell and Whitefish, traveling through the Flathead National Forest and the Stillwater State Forest before reaching its terminus at the Canada–US border near Eureka. The portion north of Hamilton travels through one of the most densely populated areas in Montana. This section also serves as a popular north–south connection between Yellowstone National Park and Glacier National Park. As a result, the road tends to become more congested between Hamilton and Whitefish. A popular bumper sticker in Montana reads, "Pray for me, I drive Hwy 93!" 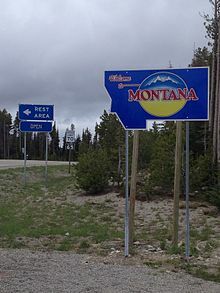 Total US 93 mileage in Montana as of 2013 is 287.919 miles (463.361 km): 90.763 miles (146.069 km) from the Idaho line to Reserve Street in Missoula via corridor N-7 (C000007) (includes 7.524 miles (12.109 km) concurrency with US 12), 5.369 miles (8.641 km) via corridor N-92 (C000092) (Reserve Street), 5.384 miles (8.665 km) concurrent with I-90 and MT 200 (C000090), and 186.403 miles (299.987 km) from Wye to the Canadian border via corridor N-5 (C000005) (includes 27.215 miles (43.798 km) concurrency with MT 200). British Columbia Highway 93 continues the numbering from the US version, with the highway continuing north and eventually into Alberta as Alberta Highway 93, finally terminating just outside the town of Jasper, Alberta. U.S. Route 93 was not one of the original U.S. highways proposed in the 1925 Bureau of Public Roads plan. However, the revised numbering plan approved by the American Association of State Highway Officials (AASHO) on November 11, 1926, established US 93 from the Canada–US border near Eureka, Montana, south through Montana and Idaho to a southern terminus at Wells, Nevada. AASHO, at its June 8, 1931, meeting, approved a southerly extension of US 93 south to Glendale, Nevada. By 1932, the Nevada Department of Highways had marked the continuation of the highway using the routing of several preexisting state highways. At the request of the Arizona State Highway Department, the AASHO route numbering committee approved another extension of US 93 in 1935. This shifted the southern terminus south to Kingman, Arizona, by way of Las Vegas. Nevada officials again extended the route along preexisting highways; however, they may not have signed the extension right away as it was not shown on Nevada's state-published maps until 1939. Until 1993, US 93 ended a short distance north of Wickenburg, Arizona, at a junction with U.S. Highway 89. When US 89 was decommissioned in the area, the US 93 designation was carried on into Wickenburg. A new highway segment opened in October 2010 in the area of Hoover Dam; the Hoover Dam Bypass replaces a highway that had been closed to truck traffic due to security concerns over the dam since the September 11, 2001 attacks. The bypass crosses the Colorado River on a new bridge downstream of the dam. The new bypass will now make the truck detour through either Laughlin, Nevada, or Needles, California, unnecessary. US 93 (with US 60 to the southeast of Wickenburg) is currently the shortest and most direct route between Las Vegas and Phoenix, two of the fastest-growing cities in America. Upgrades of US 60 and US 93 to expressway status are scheduled between Las Vegas and Phoenix. Most recently, in the 2012 Surface Transportation Act, the US Congress officially designated a new Interstate freeway corridor between the two cities as I-11, which would mostly or completely replace US 93 in Arizona. A new US 93 Alt. was built to bypass through traffic around downtown Kalispell, Montana, between 2010-2016. Currently, US 93 through Kalispell is Main Street and Sunset Boulevard, a 25 mph (40 km/h) to 45 mph (72 km/h) arterial. Three segments of the bypass comprising a total of 4.5 miles (7.2 km) were completed and opened to traffic between 2010-2013. The remaining 3 miles (4.8 km) opened October 28, 2016. The southwest 3.2 mile segment of the bypass is currently only two lanes, and is slated for expansion to four lanes with two additional grade-separated interchanges when funding permits. I‑40 east-northeast of Kingman. I-40 and US 93 travel concurrently to Kingman. I-11/US 93 are proposed to travel concurrently to Phoenix. I‑40 in Kingman. I-11/US 93 are proposed to travel concurrently to Las Vegas, Nevada. US 95 from Boulder City to Las Vegas. The highways travel concurrently to Las Vegas. I-11/US 95 are proposed to travel concurrently to Tonopah and Reno. I‑15 from Las Vegas to Apex. I-15/US 93 travels concurrently to northeast of North Las Vegas. US 6 / US 50 in Majors Place. The highways travel concurrently to Ely. US 30 east of Filer. The highways travel concurrently to Twin Falls. US 26 in Shoshone. The highways travel concurrently to Arco. US 20 in Carey. The highways travel concurrently to Arco. US 12 in Lolo. The highways travel concurrently to Missoula. I‑90 in Missoula. The highways travel concurrently to Wye. U.S. Route 93 Alternate is an alternate route of US 93 in northeastern Nevada. The southern terminus is at Lages Station in northern White Pine County, where it separates from US 93. The route continues north to West Wendover where it joins Interstate 80. US 93 Alternate follows I-80 west to Wells, where it terminates at an interchange with US 93. Alternate 93 provides a shortcut from central Nevada to Salt Lake City, Utah via eastbound Interstate 80. U.S. Highway 93 Alternate in the U.S. state of Montana is an alternate route of US 93 that bypasses the central business district of the city of Kalispell. Between 1926 and 1977 a road between Shoshone, Idaho, and Challis, Idaho, was also labeled Alternate US 93. This stretch of road is now designated as part of US 93. The pre-1977 routing of US 93 between those points is now designated as State Highway 75. Highway 93 features in the title track from Montana Cafe, a studio album by American country music artist Hank Williams, Jr., released by Warner Bros. Records in July 1986. U.S. 93 is referenced in the song "Killer Road" by Iowa blues band The Unidynes from their 1996 album Once in a Blue Room. Metal band Avenged Sevenfold included the stretch of U.S. Highway 93 between Kingman and Wickenburg, in Arizona, in the music video for their song, "Dear God". Many clips of the highway, and landmarks along the stretch of highway, are portrayed from the band's tour bus in the video. ^ a b c d e "U.S. 93 Reaching For The Border". Highway History. Federal Highway Administration. 2009-01-09. Retrieved 21 July 2009. ^ Montana Department of Transportation (2013). Montana Road Log (PDF). Helena: Montana Department of Transportation. Retrieved May 1, 2017. ^ "Milepoint Log: U.S. Route 93" (PDF). Idaho Transportation Department. January 12, 2016. Retrieved February 14, 2017. ^ Google (February 14, 2015). "Overview of US 93 in Nevada" (Map). Google Maps. Google. Retrieved February 14, 2015. ^ "End of US highway 93". USEnds.com. Retrieved October 9, 2014. ^ "Traversing the Mohave Desert on Arizona's U.S. 93". Archived from the original on 2008-10-13. Retrieved 2013-01-29. ^ "Nevada Scenic Byways". Nevada Department of Transportation. Retrieved October 9, 2014. ^ "The Lincoln Highway". Retrieved 2013-01-29. ^ Devlin, Vince (October 3, 2010). "Cameras show wildlife use Highway 93 North overpass and tunnels". The Missoulian. Missoula, MT: missoulian.com. Retrieved February 28, 2011. ^ Devlin, Vince (2013-10-15). "Missoula councilors seek tribal elders' help for 'wayfinding' signs". Ravalli Republic. Retrieved 2013-10-24. ^ "Frequently Asked Questions About the People's Way Highway Project — US 93: Evaro to Polson". Montana Department of Transportation. Retrieved 2007-09-21. ^ "US Ends - US 93". ^ Road Map (Map). Nevada Department of Highways. 1932. Retrieved 2009-06-07. ^ Official Road Map of the State of Nevada (Map) (1936 ed.). Nevada Department of Highways. Retrieved 2009-07-21. ^ Official Road Map of the State of Nevada (Map) (1939 ed.). Nevada Department of Highways. Retrieved 2009-10-19. ^ Illia, Tony; Cho, Aileen (7 December 2009). "Buffeted by High Winds and Setbacks, a Bypass Is Making History Near Hoover Dam". Engineering News-Record. New York: The McGraw-Hill Companies. 263 (18): 18. ISSN 0891-9526. Archived from the original on 6 December 2009. (The crossing) opened in October 2010. ^ Illia 2009, p. 18. "After Sept. 11, 2001, more than 2000 trucks a day have been diverted 23 miles away from the dam, costing consumers some $30 million annually in added fuel and delays, reports the Nevada Motor Transport Association, a Sparks, Nev.-based group." ^ "de beste bron van informatie over us93corridor". us93corridor.com. Retrieved January 26, 2013. ^ "Phoenix-to-Vegas interstate included in federal transportation bill". Kingman Daily Miner. June 29, 2012. Retrieved July 1, 2012. ^ "Kalispell Bypass". Montana Department of Transportation. Retrieved February 8, 2015. ^ "Ceremony set to make completion of Kalispell Bypass". kpax.com. Retrieved October 22, 2016. Parfit, Michael; Chris Johns (Dec 1992). "The Hard Ride of Route 93". National Geographic. National Geographic Society. 182 (6): 42–69. Wikimedia Commons has media related to U.S. Route 93. This page was last edited on 26 March 2019, at 08:07 (UTC).